The beginnings of misgivings began in my mind when we visited Fanjeaux, comme d’habitude, during our spring trip. Farmer Luc had let a fish farmer in to breed inconceivably large numbers of inconceivably small fish in his lake. The inconceivably small fish weren’t even useful, they were useless decorative Koi Carp that, apparently, eat almost everything in sight. There were also some inconceivably large fish that had been introduced to the lake: Grass Carp the size of nuclear submarines. 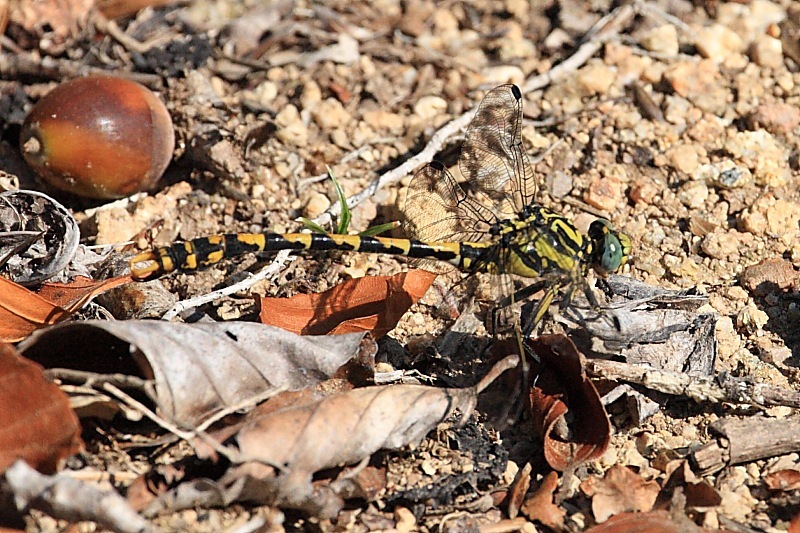 Whereas Fanjeaux had been our top Odonata spot, both in terms of number of species and individual numbers, we saw many less than I would have expected for the time of year. There was even a time when the usually ubiquitous Scarlet Darters (Crocothemis erythraea) all but disappeared. My suspicion was that the inconceivably large Grass Carp were destroying the floating vegetation making ovipositing difficult, while the small Koi Carp were feasting on Odonata eggs. Here we were again in September. What a different picture we were greeted by this year compared to the normally numerous dragonflies in Septembers of previous years. There were a few pairs of Red-veined Darters (Sympetrum fonscolombii) zooming about ovipositing furiously; the trouble is they were ovipositing into the midst of swarms of inconceivably small but irritatingly voracious Koi Carp. How many of those eggs would survive literally thousands of small jaws? Furthermore, the floating vegetation, so necessary for damselflies to oviposit, had completely disappeared down the gullets of the inconceivably large Grass Carp. There was still a relatively healthy population of Willow Emerald Damselflies (Lestes viridis) which, laying their eggs in fresh green wood, would have a fighting chance but their larvae then drop into water where … there may well be thousands of tiny decorative jaws waiting to snap them up. Prospects were not good. 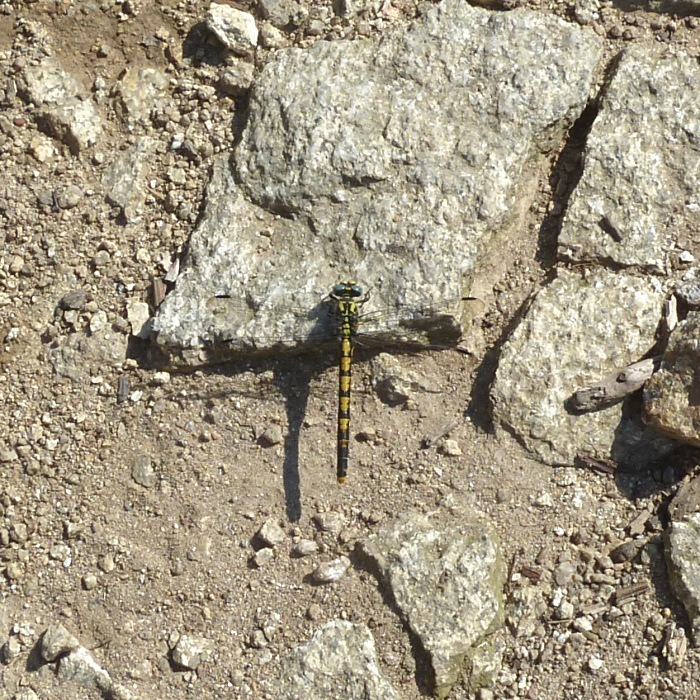 Odonata spotting was not good. I had become a rather depressed camper. Disheartened but undaunted, we tried a few of our other known haunts in the area. First up was what we refer to affectionately as La Rigole #2. It is actually Le Lac de Lenclas, a small manmade leisure lake nestling in a sharp bend of La Rigole, the small purpose-built canal that feeds water into the much larger Canal du Midi. We were wandering along the lake’s digue [dyke] when I spotted what looked at first sight lie a Scarlet Darter. I edged precariously down the 45° rocky slope of the dyke and brought my camera to bear on the suspect. As my camera came painfully slowly into focus, a definite pink hue greeted me. Joy unbounded! 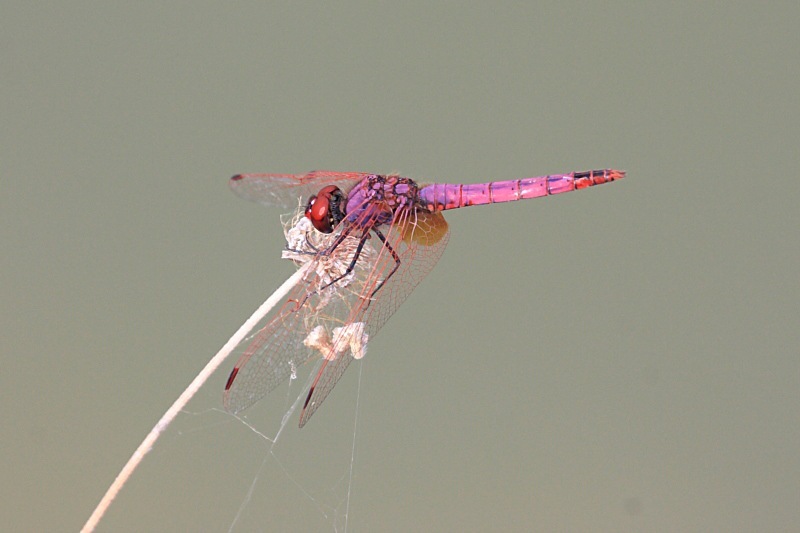 – my subject was a magnificent Violet Dropwing/Violet-marked Darter (Trithemis annulata). Carol had spotted one briefly on our spring trip but I had missed it, being otherwise occupied. New species #6. This made up firstly for my previous trip disappointment and secondly for my misgivings about our erstwhile favourite lake at Fanjeaux. What a stunning sight! We also tried what we refer to as La Rigole #1, more formally referred to as La Prize d’Eau d’Alzeau, which had been the first section of La Rigole at which we had spotted Odos. Not much was happening beside the water itself so we struck off along a track through some trees, sans proper camera, I might add – there having been no activity at the water, we really weren’t expecting to see anything. Big mistake! After not very long I spotted an unrecognised specimen flitting along the forest track in front of me. We had got the snappy camera and Carol managed to grab a distant shot. We returned to the car for lunch followed by some proper photographic equipment with which to return to the forest track. It took a while but eventually we spotted our quarry. Getting on the right side of the light was difficult and the results are not exhibition quality shots but we did get enough for an identification. Furthermore, our snappy attempt proved to be a female and the second attempt, a male, so we had ourselves a matched pair of Blue-eyed Hooktails/Large Pincertails (Onychogomphus uncatus). New species #7.